After more than a year of writing the Latin Tongue series, we are still finding surprises and learning lessons valuable and true. Let me start off by saying that when this whole Latin eating adventure comes to an end, I will look back upon it with much fondness and I hope to say that it has made me a better, more understanding person. A window to another world is open to anyone willing to sit down and have a meal with someone from another culture. There is possibly no better place to put yourself if you want a glimpse of the Latin world in the Twin Cities then El Mercado Central. Located on Bloomington and Lake, this small indoor market is packed with food, merchandise and plenty of good folks. We knew that any review of Latin eateries would miss the mark if El Mercado Central was not included. 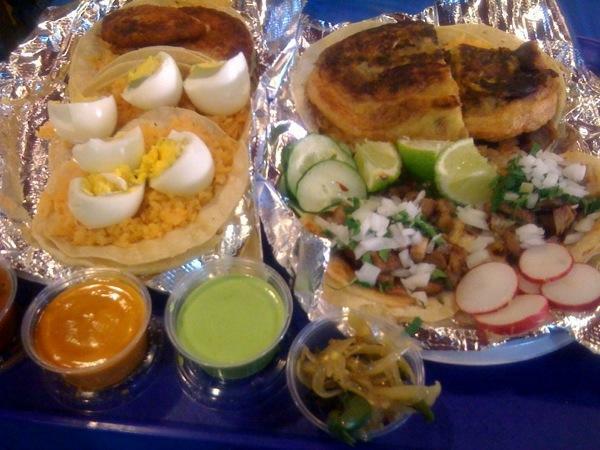 It houses a bakery, a butcher, a tortilleria, pozoleria, pupuseria, tamaleria, and four other Latin eateries. It really is a catch-all of Latin goods. Of course, the difficult part is deciding what to get on any given day. We perused the whole market many times by simply walking in circles before finally landing in front of a little taqueria called El Huachi. What drew us there were the totally unique offerings previously unheard of, such as tacos with eggs, potatoes, or chile rellenos. To accompany our tacos, we went over to La Loma for a creative selection of tamales. It was just what this Latin eating adventure is all about...tamales and tacos...the basics. Now, one of the unique things about El Mercado Central is the seating. When you are deciding on the food, ordering, and waiting for your order to be prepared, the experience feels much like being at a taqueria, the Midtown Global Market, or any other similar and busy food counter. But once you have food in hand and are looking for a seat, things become interesting...at least for those of us from the great white North. I'd say that 90% of the seats are all at 4-5 large cafeteria style tables and somehow, that tends to make many of my fellow Minnesotans a bit nervous. Sure, there are many trendy places now with the big community table, but no one really sits there, right?! At El Mercado, not only do you sit there, you sit there elbow to elbow with everyone else. Even I had a brief moment of pause when I began looking for a seat and there were just two available at the end of a very full and lively table. However, the second I even got near the seats, a couple of gentlemen immediately motioned me to have a seat and made some room. It is this exact openness and friendliness that I love about Latin eating. For the most part, it is a joyous affair to be taken in earnest and with a sense of reverence for the whole experience. Sit, enjoy, take your time, and for goodness' sake, relax. It is truly such a nice contrast to our overwrought and sometimes celebrated ideas about "fast food". It also bears mentioning that because of this attitude and openness, you suddenly open yourself up to new opportunities and experiences. Sure enough, despite a language barrier, we found ourselves in a conversation about work, food, and life with the kind folk around us. As a matter of fact, everyone there seemed to be engaging in a conversation with everyone else and it seemed obvious to me that not everyone was family. Ok, finally, what about the food? Let's start with El Huachi. As mentioned, we passed over many Latin eating options for what, to us, was new and different. We found ourselves staring at three totally unique tacos. First were the tacos con huevos. 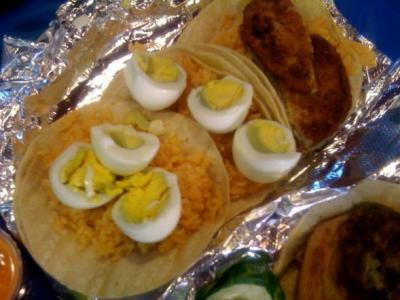 When you don't ask questions, you get surprises and yes, it is surprising when your taco has 3 hard boiled egg halves staring at you on a pile of rice. It looked bizarre and yet so simple. I thought I was disappointed, until I tried the darn thing. It was delicious and I can't even say why. Somehow, the tortilla, simple yellow rice and hard boiled egg went so well together. Then you have the option of adding pickled peppers and salsa from their salsa bar. It's just a heavenly little, ummm...breakfast, lunch, snack or dinner. With the egg experiment having gone so well, I moved on to the taco con papas, which they warned us (by pointing at it) was this puck-like potato cake. Sure, why not. When it came time to sink my teeth into this, it was definitely one of those love/hate moments, but since I happen to love the occasional greasy treat, it was just fine with me...again served on rice and that's it. I can see this taco appealling to vegetarians, and those looking for a quick breakfast or antojito (easy to take on the run street food). Tacos con chile rellenos y tacos con carnitasNext up was the taco con chile rellenos. Really? Yes, really. Get ready for more grease as you get (you guessed it!) 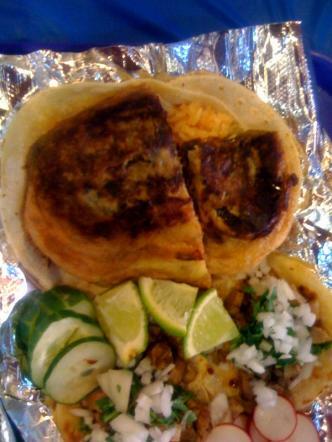 rice and a deep fried chile relleno stuffed with cheese on a pile of tortillas. It really was somehow so satisfying and although I was not amazed (it's a taco, don't expect the best rellenos you'll ever eat for $5), I guarantee that I would order another one next time I am there. As a matter of fact, I want one right now. The simple brilliance here is that there is a way to take chile rellenos on the go. 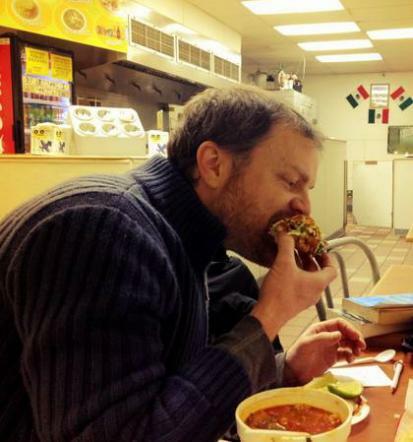 Finally, for some reality and balance, we tried a simple taco con carnitas. We were not disappointed. It was really great carnitas. Super tender, yet not without flavor. Often times, carnitas can be rather subtle and lost in the crowd of flavors, but this one had something else going for it. The meat was enveloped in a richness from being cooked in something more savory and complicated, such as good pork broth, that made this version of carnitas more savory than some. On to the tamales!! La Loma is no stranger to anyone who has eaten around the Twin Cities. They have a fairly good sized catering business and a big shop at the Midtown Global Market. Despite their recognition, I'm not sure how many folks could tell you that right inside the front door of the Mercado Central they have a shop set up. Either way, La Loma is a great option for tamales and somehow, I like El Mercado's tamales even better than their location just blocks away at the Global market. 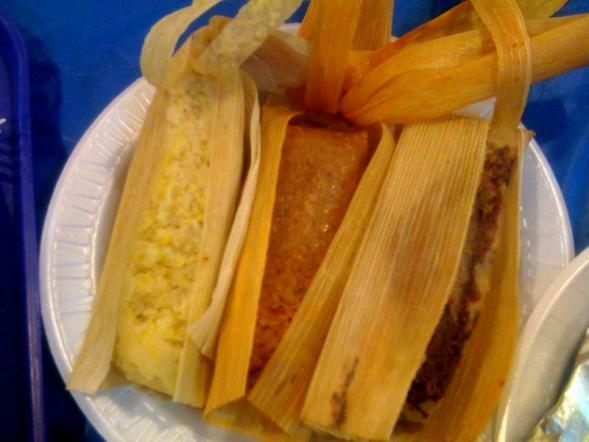 I selected four tamales for our eating pleasure: Oaxaqueno, Puerco, Mole and Elote. It was a great balance of flavors. To begin, the Oaxaqueno obviously hails from the Oaxaca region and is notable for its signature banana leaf wrap and dark red abodo sauce. They tend to be my favorite and most mysterious of tamales, combining flavors of pepper, smoke, green banana and salty pork (often rib meat). This one held up its end of the bargain on smoke, meat, spice and heat but the large amount of meat (shredded pork in this one, not rib meat) dominated the tamal so much that the subtleties of the masa corn were missed. It was great, but not epic. The puerco, or pork, tamal was amazing. Their corn husk wrapped tamales have so much shape and form without compromising on moisture content that it seems almost unreal. On this day in particular, they were not too wet or too dry and perfectly formed. Possibly their best tamal in its perfect simplicity. Take this same idea and add to the pork a rich, sweet, and tangy sauce. Add a bit of heat and some clove and pepper and you have the mole tamal, which we also loved and ate with relish...Yum. Finally, we come to dessert...sort of: the elote tamal. For newcomers to this treat, what you have here is a very simple sweet corn tamal. Imagine fresh sweet corn ground up and prepared tamal style. No filling, nothing but sweet corn masa. If some one is offering an elote tamal, chances are it will be good and the one we ate from La Loma was amazing. It was very flavorful and had an unexpected honey-like essence to it. In fact, it was so very sweet and tasty that it demanded the accompaniment of a Mexican coffee con canela (coffee with cinnamon) to complete the experience. Save room for an elote tamal because they are really outstanding and a nice dessert without being too sweet. So there you have it. It was a great eating experience and if I went back, I would order much the same. I would definitely recommend trying the tacos con huevos and a couple tamales, and I for one will try a pupusa from El Rincon and some pozole from La Perla next time. The options are almost endless at El Mercado Central, and I can be excited about a future full of eating adventures there. Been there? Let us know what you think/eat below! Current eateries: El Huachi, Taqueria la Hacienda, La Perla tortilleria y pozoleria, El Rincon pupuseria, La Loma tamales, Cocina La Mexicana, Manny's tortas. Surprise: Definitely the communal atmosphere, but also the nice variation of food. The selection of Latin fare is well-balanced without a lot of overlap. Prices: Variable, but most everything is under $10 and many, many items are under $5. Tacos were $2-$2.50 and $5 for the chile relleno taco. Tamales were about $2-2.50 and the Oaxaqueno was $3.50. Language: Sure, it would help to speak a little Spanish, but we ran into no real difficulties with English. Every now and then, you might have to take a leap of faith or just hand them a $20 when you are not sure what your total is. Payment: Both places we visited accepted cash and credit. I think most do, but bring a little cash because its the right thing to do. Lawrence Black is a writer and editor at Simple, Good and Tasty. He can be reached at lawrence@simplegoodandtasty.com. Beware of his crazy eyes as they search for the next great Latin eatery as well as his almost constant onion breath. Peee-ew. Our last Latin Tongue review was: Maya Cuisine.